I am a lone diner at the Caledonian Inn, but I have a lovely waitress checking regularly to make sure I have everything I need. I’m thoroughly enjoying my book. I’ve had a call from a friend in Sydney who I haven’t seen in ages. The Chardonnay is crisp and soothing. My salmon is perfection. What more could a girl want? 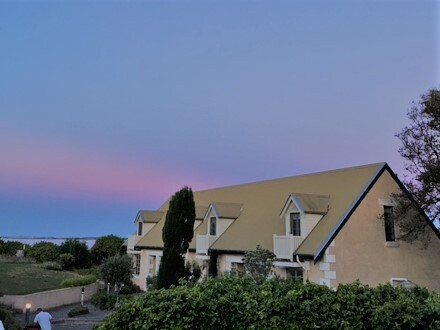 I have been in Robe for almost a fortnight and this is my fourth visit to the Caledonian Inn. The night we arrived, we wandered down to the beach after dinner, and we ended up stopping in for a drink. Two years ago the hotel’s lease was bought by the Prest family Its hard work, they admit, but they seem to be thriving on it. Since then, the inn has been given quite a makeover. There is music most weekends, and the beach cafe in the beer garden is due to open for the summer in mid December. While my parents caught up with old friends, I joined the fun on the dance floor, as Beachport musician, Bec Willis, played all my favourite cover songs from the ’70s and ’80s. On Sunday we went back for dinner on the balcony, where we tucked into a beautifully presented and delectable duck breast with a spicy plum sauce. It was a great spot to watch the sun set, too, but eventually I wandered down to the front lawn for an even better view from a wicker armchair above the sea. The following week, I went again with a friend from Manila days, to relax in the courtyard beergarden brimming with sunshine and jolly holiday makers. There, we happily overindulged in a tasting platter for two, followed by a wonderfully spicy lamb curry, all washed down with a soothing Mount Benson Rosé. The antipasti included some tasty local sausage, Kalamata olives (my favourites) and crispy garlic ciabatta, which I dipped vigorously, lovingly into olive oil and dukkha. The lamb curry was thick, aromatic and full of flavour, and when the spiciness started to overwhelm my tastebuds, there was always more wine. My only sorrow was that our curry followed so hot on the heels of the tasting platter that I had to admit defeat before the bowl of lamb was even half empty. Robe, once a busy port in the south east corner of South Australia, was established in 1847. The Caledonian Inn was built a decade later, and this handsome, heritage listed building has been an integral part of the town ever since. The most well-known story about it relates to that famous writer of bush ballads, Adam Lindsay Gordon, who dropped into the pub, and ended up marrying the publican’s daughter. Known locally as ‘the Cally,’ the pub seems popular with locals and visitors alike: the bar and restaurant were both humming with patrons every night that I have popped in. And the staff are already running flat out, although it’s not quite summer. The chefs are a truly multicultural bunch and currently include a Sri Lankan, an Indian, a Chinese-Australian and a Frenchman, and the team is soon to be joined by a Filipino. So ‘Mabuhay‘ to Robe! Each adds an element of exotica to the menu, which is unexpectedly elegant for pub fare, and the portion sizes are sensible . With a little advanced warning, you can even reserve fresh crayfish. Trip Advisor have awarded the hotel a certificate of excellence, and it is well deserved. 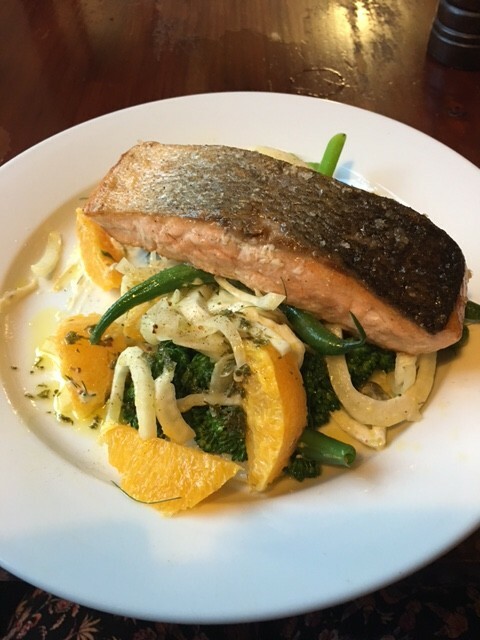 The food is great, the service is friendly and welcoming, and the atmosphere is lively. The wine list is largely South Australian, and includes a number of interesting local wines from the Coonawarra and Limestone Coast. I have timed this final visit well. When I arrive, the restaurant is full, and I must wait for a table, but it’s not long before the majority of diners peel off and leave me to soak up the late evening peace. The dessert menu looks tempting (pavlova? coconut pannacotta?) but I decide to finish with a glass of my favourite Bird in Hand bubbles and return happily to my book. 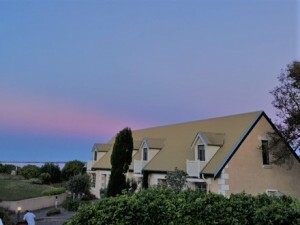 This entry was posted in Australia, Food & Wine and tagged Limestone Coast, Robe, South Australia, The Caledonian Inn. Bookmark the permalink.